The land east of Death Valley in Nevada is just as empty as the national park, crossed by several other long valleys bordered by barren, rugged mountains. 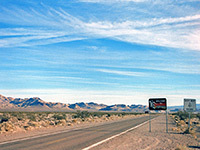 One road passes through this area - US 95 from Las Vegas to Tonopah, and the only significant town along this 206 mile drive is Beatty, which is still quite small with a population of about 1,700. A 20 mile road leaves town and heads southwest - across a wide, flat desert basin then through a range of mountains and down a long winding ravine into the national park. All approaches into the park are dramatic, but this is probably the best - the immediate scenery is interesting and the road provides good, long distance views over many miles of the central valley. 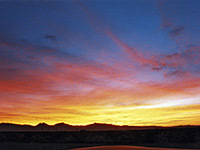 At an elevation of 3,300 feet, Beatty is a little higher than most of the land either side along US 95, and is enclosed by rocky hills with several working mines nearby. The town is quiet and atmospheric, with the appearance of being little changed for many years. 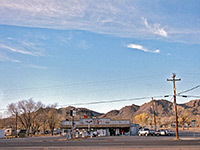 It is also a good place to stay - there are several motels offering accommodation much cheaper than in the Park. Other facilities include a rather sleepy casino, several stores and an NPS ranger station. Three miles west of town, Rhyolite is a semi-preserved ghost town that has declined from a busy provincial centre in 1908 to a few derelict but evocative buildings now administered by the BLM. 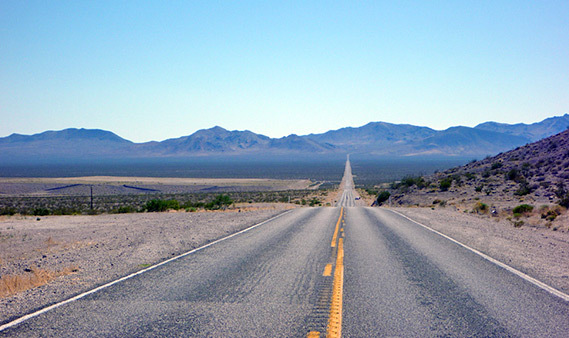 Road 374 crosses the brow of the hills at the edge of town and is then perfectly straight for 9 miles, across the Amargosa Desert and into California. One side road branches west - the one-way Titus Canyon Drive, which offers an alternative 4WD route into Death Valley; it winds through the Amargosa Mountains and along a deep canyon, emerging a few miles north of the Stovepipe Wells junction. The main road also climbs into the mountains, reaching 4,316 feet at Daylight Pass. Ahead lies a relentless descent to below sea level over the next 14 miles; in summer the corresponding temperature rise is around 20°F. The valley comes fully into view at the ominously-named Hells Gate (700 feet), where a separate road forks south towards the main visitor facilities at Furnace Creek. The surrounding landscape changes from rocky cliffs to a low canyon with rounded clayish hills of many subtle tints of color, similar to the famous badlands of Zabriskie Point further south.